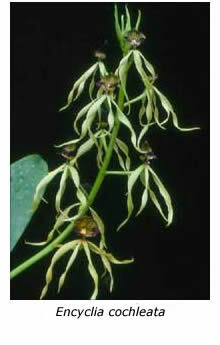 Most of us grow a few encyclias, although in older collections the plants are probably still labeled as epidendrums. Today, most of the former epidendrums with bulbous pseudobulbs have been reclassified as encyclias, while those with narrow canes, like the reed-stem “crucifix” orchids, remain as true epidendrums. Actually the above “definition” is only a rough guide, the proper definition (only one of them) being that in epidendrums the lip and column of the flower are united for almost the entire length of the column, whereas in encyclias the lip is united to the column only near its base. 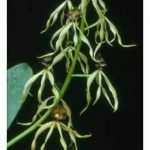 Despite the above reclassification, the genus Epidendrum still comprises over a thousand species, while Encyclia has about 250. All are natives of the Americas. 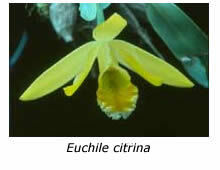 In their book The Genus Encyclia in Mexico(1974), Dressler and Pollard divided the genus into three sub-genera (Osmophytum, Dinema and Encyclia), although the second of these contains only one species, the widely grown miniature Encyclia polybulbon, sometimes labeled Dinema polybulbon. This delightful species can be grown in a ‘cosy’ shade house in Melbourne but does better with a little warmth in winter. The entire plant stands only about 50 mm tall and in late winter is covered with small yellow-brown flowers, each with a white lip. It quickly spreads to cover its shallow bowl or mount. Another popular species is Encyclia cochleata, often claimed to be the first epiphytic orchid to flower at Kew Gardens (in 1787). In fact that honour belongs to its close relative Encyclia fragrans, not that it’s important because both flowered there within a few months of each other. Both belong to the group known as cockleshell orchids, because their striped, concave lips are said to resemble cockleshells. The lips on these non-resupinate flowers are their most prominent feature, the narrow petals and sepals drooping down over the ovary and pedicel. One of the major attributes of Encyclia cochleata is that it remains in flower for many months, sometimes until the new growths mature and begin to flower. The flowers open sequentially, about three to six flowers being open at any one time. Many encyclias have rather small resupinate flowers. Two that I grow are E. alata and E. michuacana. The latter is currently in spike on a small plant less than 150 mm tall, an ideal size for my limited growing areas. Imagine my horror when I found it described by Dressler and Pollard as having pseudobulbs up to 120 mm tall and leaves to 630 mm, while its inflorescence can reach 2 m! Another encyclia that I will never part with, despite its considerable size, is Encyclia prismatocarpa, which proudly carries its flowers on tall, upright inflorescences; they have spotted or barred petals and sepals and a contrasting purplish-pink labellum. I’m still waiting for my plant of E. cordigera, which has attractive brown flowers with striking purplish-red lips, to reach flowering size. One has to be patient with some species – I bought my E. prismatocarpa as a “near-flowering-size” plant but still had to wait five years for it to flower!! 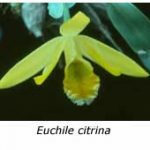 The two most attractive species in the genus used to be E. citrina and E. mariae until they were transferred to the new genus, Euchile (meaning beautiful lip) by Carl Withner in 1998. I include them here regardless. Unfortunately neither is easy to maintain in cultivation, probably because they have rather demanding cultural requirements. Euchile citrina hates to be wet for long. Its leaves have a water-repellent surface and the plants are always found in nature hanging down below branches or rock overhangs, so that no water can lodge in the crown of the plant. Its pendant, waxy, lemon yellow flowers are delightful. Most hobbyists find that it grows well as a small seedling, flowers well once or twice and then enters a slow decline, from which it seldom recovers. Euchile mariae (syn. Encyclia mariae) was not discovered until 1937 because it grew in such an unlikely area for orchids that no one had looked there previously! It grows in rather dry oak forests at 1000-1200 m elevation near the border of Mexico with Texas. Its greenish yellow flower has a prominent white lip with green veins at the base. Why not try an encyclia or two? Start with the miniature Encyclia polybulbon and work up from there!